Description: David is Artie’s grandfather, the father to Artie’s father, and the stepfather to Judi Saxon. He is a tough and strict instructor to Artie’s Wolkhar trials, but he is like that because he believes in Artie’s talents. After what happened to Artie’s father, David took it upon himself to look after Artie as a father figure; give him life lessons and raise him to be strong and proud, but sometimes his crotchety attitude can get in the way of that. Before living in Windagill Valley, David made residence in a Wolkhar village and was recognised as a strong-headed individual who wanted to see his men get stronger, but always bossed them around in exercises and routines, like an army captain. His bossy attitude often frustrated his wife, whom they were always at each other’s throats. After a certain incident happened back at the Wolkhar village that involved Artie’s father and Judi, David and his wife got a divorce, and hardly talked to each other soon after. When Artie was born and his parents wanted to go out and see the world, David decided to come and join them, to get away from the village and his domestic problems, and start fresh. But after what happened to Artie’s father, they decided to make residence in Windagill Valley, and thus David accustomed to the peaceful lifestyle enough to become a bit of a slouch. Unfortunately for David, he has an incredibly bad back that acts up whenever he does something too physical, like lifting very heavy objects or running at a great speed. Even though his age may be a good reason for that, the actual reason for it is due to his last stubborn endeavour. When Artie’s father died, Judi wanted to make residence in Windagill Valley. And thus, David took it upon himself to build their house. And as stubborn as he is, he uses his past achievements as an excuse to not have anyone help out and do all the work himself. He literally built Judi’s entire house, by himself, with his bare hands. But that was the straw that broke the camel’s back, or literally, his back. It gave way and it now seems to be permanently fragile. Despite this, David still wants to prove he can be useful in physical labour, but his back always lets him down. He now lives peacefully at Judi’s home, and finds he can’t resist snatching some of her raspberry cakes whenever she makes some. Appearance: In contrast to Artie and Judi, David actually has a square head, with a big roundish nose. His eyebrows are also very thick and round, in contrast to his beady eyes. He may not be as rotund as Judi, but hsi stomach is still relatively roundish. He wears pointy shoes and has a fondness for big belts, which he likes to wrap around his gut. His afro is actually just as round as Artie’s is, but the fixture of his hat squeezes it down, making it into an oval shape. He also sports a classic old guy beard, rich in its representation of wisdom and experience. 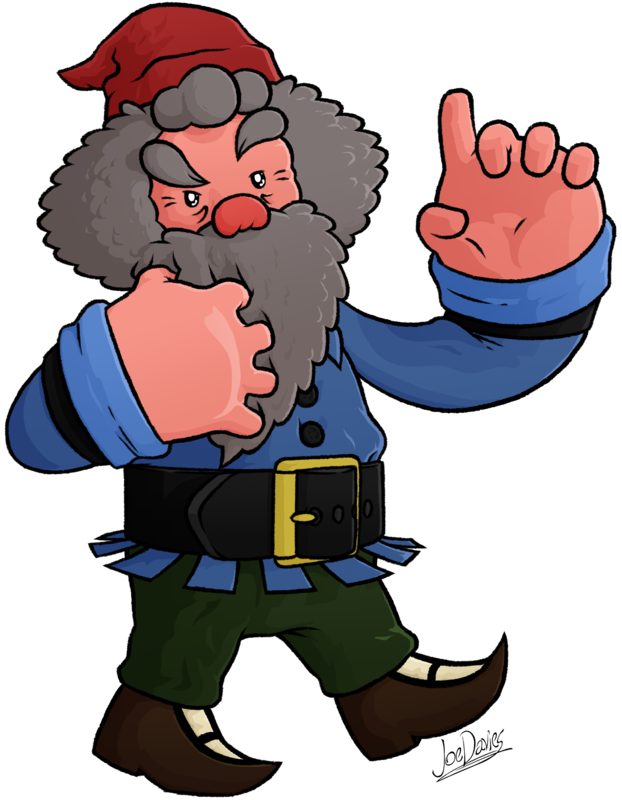 – As you can see, his attire is heavily inspired by garden gnomes. From the large beard and big belts, to the pointy shoes and hat, and blue shirt. His name is even a classic name of a gnome.